Carries a 20ft standard height container only! We offer temporary intermodal equipment solutions. From shipping containers and field offices to ISO chassis. As one of the originators of the used container/chassis industry over 38 years ago TRS is an educated partner. TRS offers guidance and recommendations in choosing rental vs. purchase, new vs used, and the size and type of chassis. 40ft goosenecks, 8-pin locks, tri-axles. 40ft – 45ft extendable chassis. Approximately 10,500lbs tare weight, they can carry 54,000lbs gross weight load. Can be stacked 3 high and chained down to economically transport multiple units. Condition: Roadworthy meeting FHWA specs. Constructed of high-tensile steel, zinc-rich primer and black urethane topcoat. For seasonal business or rapid deployment in disaster situations, TRS can begin delivery quickly. Rent to buy options during the course of your lease. Transports an empty or loaded 20ft standard container. Properly maintained a used chassis can perform for 30 years +. Used chassis are readily available compared to new production. Visit our facility to survey and evaluate the quality, price points and grades of our chassis. Gross Vehicle Weight 64,000 lbs. Landing Gear 2 speed with square leg + low profile sand shoes. 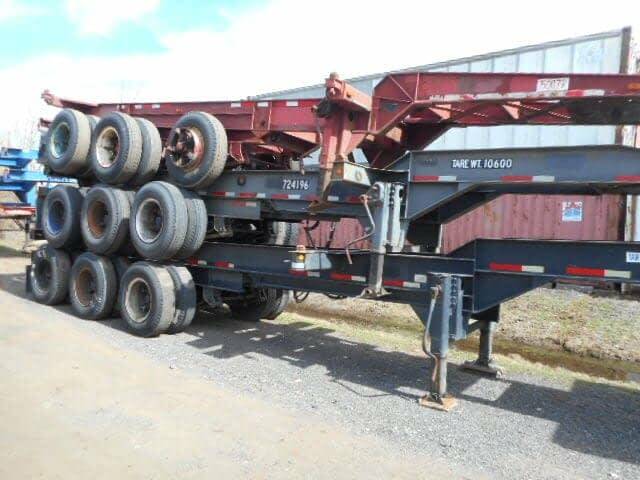 Substantial neck, 3 axles, + 41ft extension, Tri-axles haul up to 53,000 lbs in a 20′ container. Add to your fleet during busy seasons without expense of ownership. Chassis raise the container to dock height for easy loading. Chassis transport empty or loaded containers. Cost effective: no wasted time chaining down; load + lock. Driver safety: No chaining or climbing onto the roof of a container. During a long term agreement chassis may be brought in for repairs at client cost. During course of lease, updated registration and plates will be provided. No blocking is needed since the chassis allows full access to lift. Renting keeps you moving when your equipment is down. Setups can convert into turnkey portable event space or portable generators. Small outlay of capitol to enter into a lease. TRS offers a rent to own feature with the buyout price declared upfront. A signed lease agreement stating Lessee responsibilities is required. Chassis is inspected and documented outbound and inbound. Easy conversion from rental to a buyout at any time. Insurance certificate naming TRS Loss Payee and Additional Insured is required. Lessee responsible for damages or tire swaps while on rent. Monthly billing is on Credit Card only. Offer buyout options and the value of the chassis is in the lease agreement. Reasonable 30 day minimum on all rentals. The rate is based on the term of the agreement. Longer the term the daily rate goes down. Renting a chassis will prevent a large outlay of capitol. TRS sells New and Used Chassis in addition to our Rental services. Chassis provide a safe and cost-effective means to transport empty and loaded containers. 20ft flushbacks, sliders, tri-axles, 40ft goosenecks, tri-axles, 8-pin locks and 40’-45’ Extendables. Owning a chassis allows you to claim depreciation on your taxes. Could be less expensive over the lifetime of the asset with chassis lasting 30 years plus. “As Is” chassis are suitable if you have a mechanic on staff. Alternatively, we sell roadworthy / FHWA condition for immediate use. Basic Roadworthy units for export. Refurbished option which includes new tires, brakes and paint job. 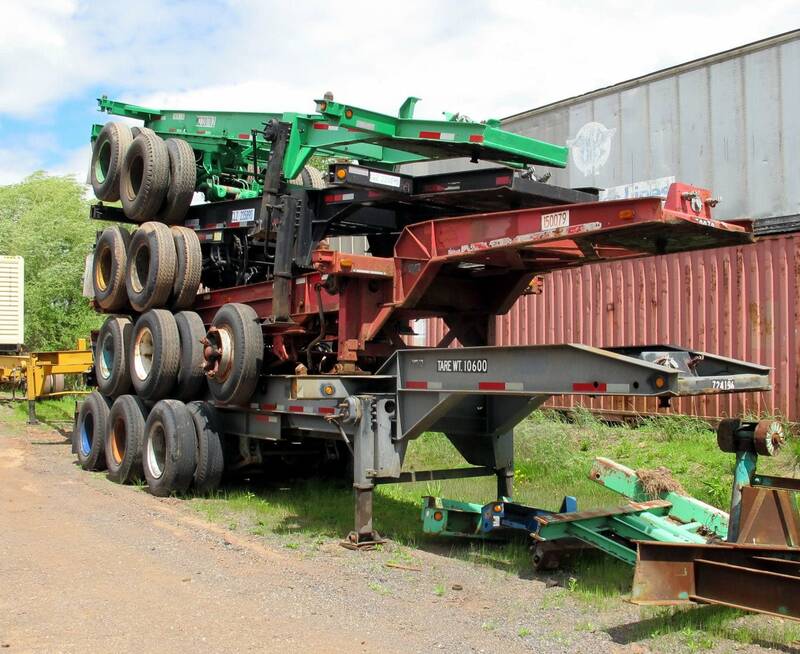 TRS can house your unwanted chassis and sell on consignment for a small fee. TRS can mount your plate and registration on the chassis. TRS purchases chassis back when the market will allow. Upon payment in full client receives Title and Bill of Sale. We also offer registration services. Consignment if you want TRS to sell your chassis. Availability and pricing subject to change. Specifications can vary based on Manufacturer, Age and State Requirements. The technical information provided is for guidance only and TRS cannot be held responsible for original specs and tolerances.